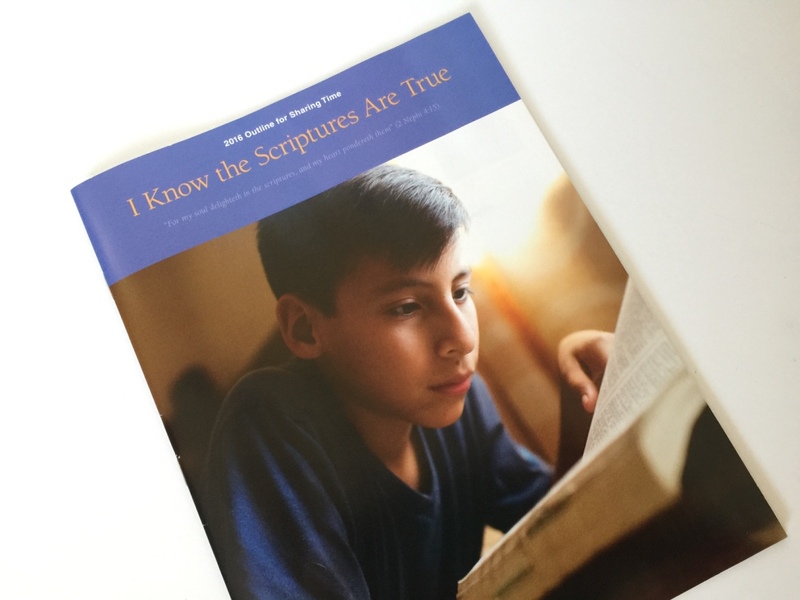 Ask your Primary Presidency if they have received their copies from the Bishopric (or ask the Bishopric directly!). We only got 3 copies, but in my opinion, the Music Leader should be one to receive a copy! I've been thumbing through it to get my 2016 CD song list ready go to (our primary hands out CD's as a Christmas present from the Primary each year. See what I did last year HERE. You can also make a DVD. See how used them in a DVD format last year HERE!). UPDATE: Find my 2016 CD tutorial HERE. *These are my 2 "song of your choice from the Children's Songbook" choices. This year, I am contemplating teaching Scripture Power in addition to the regularly scheduled 8 program songs. There are several repeats and/or simple songs this year (we all know I Love to See the Temple) so I think with any extra time during the months, I'll throw this one in, call it our theme-of-the-year song!. Find the sheet music HERE and you can listen and download the MP3 HERE. 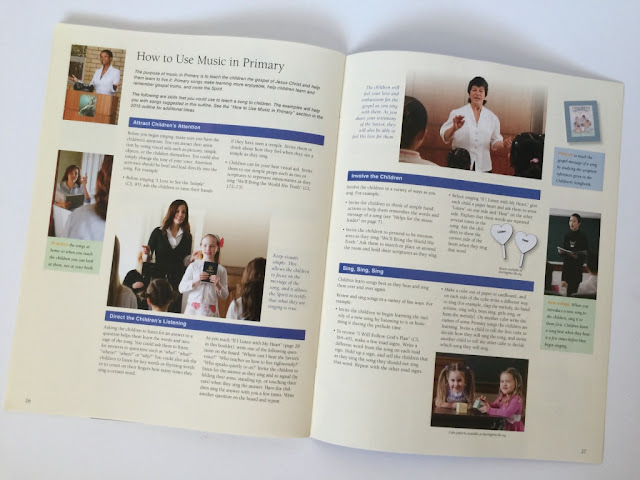 Page 1 has a "Singing Time" section which gives simple instruction on how singing time should run, how much time you get, etc. Also are guidelines for the Sacrament Meeting Presentation. 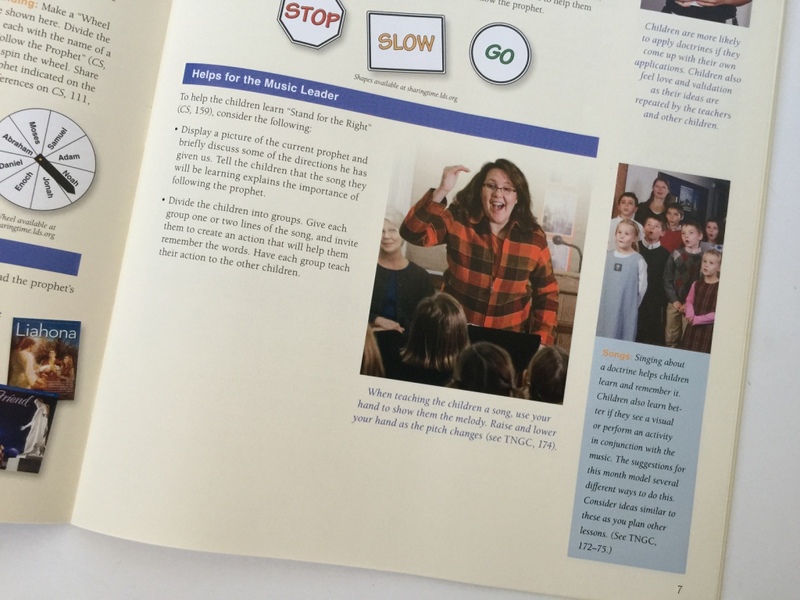 It also has a "Tip" on the right that says, "Singing about a doctrine helps children learn and remember it. Children also learn better if they see a visual or perform an activity in conjunction with the music. The suggestions for this month model several different ways to do this. Consider ideas similar to these as you plan other lessons (See TNGC, 172-175)"
Page 26 - 27 is entitled "How to Use Music in Primary" and has some great information on attracting children's attention, directing the children's listening, involving the children and how to sing, sing, sing (which can actually be really hard)!! I'd say a really valuable tip is on pg. 27...PRACTICE AT HOME: To teach a song effectively, you must know the song yourself. Practice at home so when you teach the children you can look at them, not at your book. Page 28 is a copy of this year's theme song (to be taught in January), If I Listen With My Heart. You can download the music by downloading the whole PDF 2016 Sharing Time Outline found at the link above. Anyway, there you have it, a brief outline of 2016's outline. If you haven't looked through it yet, I'd highly recommend it! January is just around the corner and it's nice to have a head start on next year! Coming shortly is my 2016 Primary Music CD Tutorial...stay tuned!! We started a tradition in my ward primary to have "Scripture Power" as the closing song each week. We encourage the kids to bring their scriptures each Sunday and have them raise them high as we sing. I then count how many scriptures came to church that day and we have a friendly contest by JR and SR to see who brought the most and always encourage them to beat last week's number! Thanks for your comment! Our ward did that YEARS ago and it has since stopped since a change in presidency - maybe I should look into bringing it back - that's a FABULOUS idea for learning the song!! Thanks again!